BBC NEWS | UK | Magazine | Haven't we seen this election before? Haven't we seen this election before? The Obama v McCain race for the White House has been run before - NBC's The West Wing pitted a charismatic, non-white Democrat against a maverick, experienced Republican. 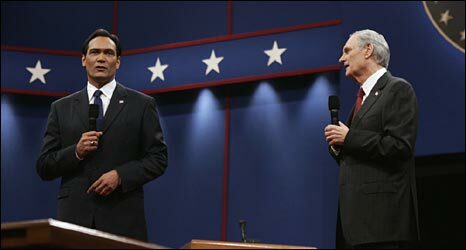 In the The West Wing's fictional 2006 election, actor Jimmy Smits played Latino presidential hopeful, Matthew Santos. He announced his intention to run with the words, "We live in cynical times, but hope is not up for debate… there is only hope." "Barack Obama was one of the people that I looked to draw upon," admits Smits. Just at the time that the Matt Santos character was being developed, Barack Obama gave the key note address at the 2004 Democratic Convention introducing John Kerry. 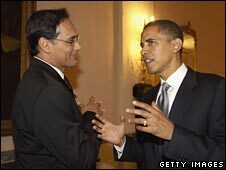 Smits studied the speech and then met Obama at a political event where they were both speaking. "We were in this tent that normally would have been filled with people and for some reason it was just me and him. And we were talking about Chicago politics and he looked at me and said, 'I think I can make an impact'." Similarities between the fictional Matt Santos and Barack Obama are striking; Santos was a charismatic newcomer, promising hope and raising the possibility of the first non-white Commander in Chief. In both style and content, he's a reflection of Obama. Eli Attie, a writer and producer on the show, was given the task of developing the character. Attie knew Obama's key aide, David Axelrod, so he called him for some advice. "David Axelrod helped explain to me how Obama viewed his race, how he refused to be defined by it. In politics people are always looking to force people into categories: What's your slice of the constituents? What's your political base? And it seemed that Obama was very resistant to that idea and that was a key element in his success." Attie drew on this information in writing his scripts. As fans of The West Wing will remember, the issue came up several times during the fictional race for the White House, but Matt Santos never let it distract him from his politics. "We wanted to make sure that Santos was communicative and politically strong, and then you have the other layer there, that he just happens to be Latino," says Smits. He sees that it is the same for Obama; his ethnicity is important, "but is not the be all and end all of the man". 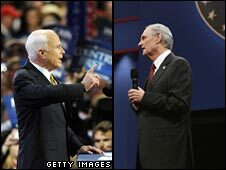 Running against Matt Santos in The West Wing's election was Arnold Vinick. More by coincidence than design, he bears a striking similarity to John McCain. Played by Alan Alda, Vinick is a veteran Republican from out west, wise in the ways of Washington. A maverick on some issues, he is attractive to those in the centre ground. "The McCain candidacy is very similar to the Vinick candidacy," says Lawrence O'Donnell, who wrote the character. "They are good at appealing outside their own party. And that is actually one of their problems, within their own party, of Republicans not believing that they were Republican enough." In The West Wing, Arnold Vinick chose a very conservative Republican as his running mate in an attempt to appeal to his own political base. It's a move that McCain seems to have mimicked in his choice of Sarah Palin. The series took up real political issues, still hot topics this year - the price of oil and bio fuels, national security, immigration, health care, jobs, gun control. When The West Wing held the all-important TV presidential debate, the show went out live, just like the real thing. "Both Alan Alda and myself prepared as if we were candidates," say Smits, acknowledging how it put genuine pressure on the actors to know their positions and get it right. Some of their exchanges we may hear again in the coming weeks; Vinick declared himself pro-nuclear, Santos spoke against that position. Santos committed to government spending to improve health provision for all, Vinick promised to never raise tax on healthcare. So what does this tell us about who is going to win? As The West Wing's election campaign unfolded, the candidates were neck and neck, both on screen and in the writer's room, with rival camps keen to see their candidate getting ahead. "It was like two campaigns on the staff of the West Wing firing shots across the bow," says Eli Attie. For viewers the outcome was far from certain, much like this year's real election. For those still ploughing through West Wing DVDs, we won't give away the end result. But so far at least, events have been a strange case of art reflecting life, reflecting art. "We ran this campaign in The West Wing before it happened in the country," says O'Donnell. "We got lucky on a lot of the stuff - we're not that smart."